While we were at Lake Tinaroo Falls we went for a walk to view the dam - Neil I am sure got us lost while all the time proclaiming that he knew where he was going!!! I think they are doing construction work on the dam. While walking back Neil came across some mushrooms just growing on the side of the road and all the way back we began plucking these mushrooms so we had them for dinner along with our bacon, eggs and avocado! We reckon we got around 1kg worth but once you cook them they reduce to next to nothing! but they were absolutely delicious. but before cooking them we had to painstakingly peel them as they were dirty and had grass on them. I know you are looking at the distance today and thought that it is hardly worth cycling ... well let me tell you 31km in The Atherton Tablelands is the equivalent to about a 80km day!!! I forgot just how hilly it is up here ... or maybe I was alot younger and stupider 15 years ago when we were last here and the hills were nothing! To add to our woes we are having very strong headwinds (around 25-30km per hour rates) and on the exposed parts of the tablelands it is relentless! There was very little rain last night only a very misty rain for a bit and again this morning it wasn't too bad when we started out but by the time we got to Malanda it was a slightly heavier mist! But first let me tell you about our morning - we got a rather late start due to a guy coming over to chat to us ... he remembered us from Charters Towers and he asked if we remembered him and off course we couldn't but he said that he met us as we were coming into Charters Towers and then I remembered it was the guy we chatted to outside the IGA! He said he only knew we were here because he went out to dinner last night with another couple that were a few sites down from us and this guy mentioned that 2 cyclists pulled up earlier on and the guy chatting to us asked his friend were the cyclists a young man with a beard and a young woman with a very nice tan ... Neil and I both laughed at our descriptions (I was laughing more at the fact that Neil was labelled a "young" man and I think Neil was as well!!!). Anyway his friend said yes and the man chatting to us asked if the cyclists were towing a dog and his friend said yes and that is when he knew it was us as we are the only ones around this area towing a dog! So we chatted to him for around 3/4 of an hour. We got some useful information from him - we found out the bowls season starts in September so basically there will be a mass departure of people within the next 3 weeks from Queensland! So there hopefully won't be some many people on the road soon! Once we finished chatting to him we continued on packing and when we got to the gates of the caravan park we were ascounded by a Chinese family and they were so impressed by us and our cycling that they took a video of us! The man was Australian and his wife was Chinese and her parents were over from China visiting and they were fascinated by us cycling all the way from Melbourne! His wife was fascinated with the fact that we were in a tent and wanted to know if I missed the comforts of a home and was it easy in a tent ... all I could say (as no one has ever asked me that!) was that you sort of adapt to life on the road in a tent! So we managed to get away around 9.15am - quite late considering we got up early. The ride back to Kairi was up and down and we knew that - but there is one mother of a steep hill just past the campground and I tell you there was an elderly couple walking up the hill and they were marginally slower than us riding our bikes!!! Once at Kairi the road flattens out a bit and you go through farms that we think are growing corn but not corn on the cob more for maize (I am not too sure on that) as the corn plants are all dry so I am not sure if they dry the plant and corn cobs before they cut them and then grind the corn kernels down to maize or some sort of flour. But there are heaps. 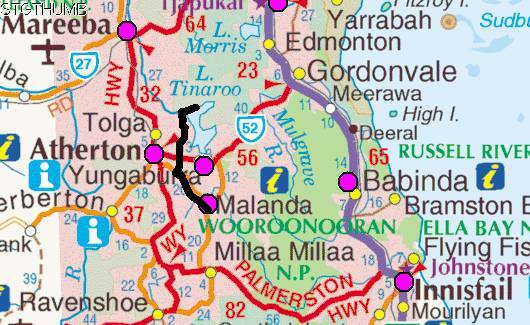 Once we got to the main road between Yungaburra and Atherton we crossed over and took a small road to meet up with the main road between Malanda and Atherton. Cycling the small roads was alot better than going on the main roads! 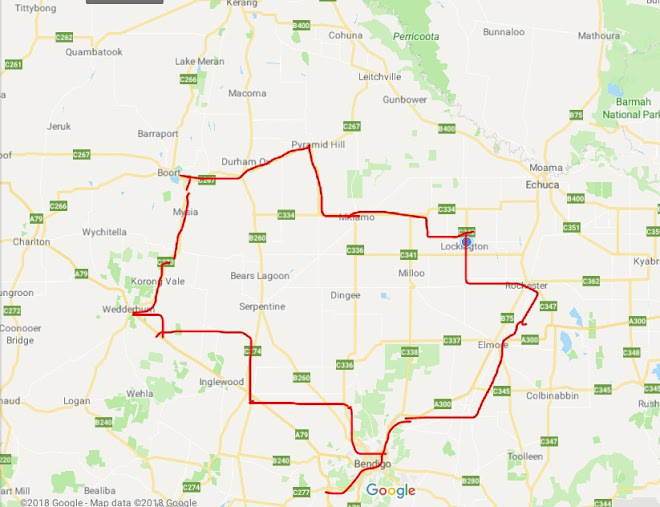 although the roads we did take are actually the roads for the B Double truck route but there were none today being a Sunday and a long weekend. Once we joined the Malanda-Atherton road it became very undulating and the hills were just so steep and only a very thin shoulder but all the cars today were really good to us and gave us plenty of room ... maybe they felt sorry for us! So up and down, up and down, up and down and all the while I am saying 'man I hate this place'!!! I am never coming back here on the bike! Malanda is up in the hills and so it is continually in cloud and I think that is what we were cycling in most of the day thinking it was a misty rain but as we got closer to Malanda the road became wetter and the mist became heavier and you could say it was a gentle drizzle. We got here just on lunch time and the campground is wet to say the least. Our campspot is a little muddy around the door but it is on high ground in case it does pour and we then have good drainage but nevertheless due to the rain the roads around the parks a soggy with mud and although I have had a shower my feet are wet and a bit muddy! There are not too many camping - one other group in tents and another lady in a converted van. There is a kitchen (sort of!) with a fridge, cooktop and sink with hot water and a sheltered roof and table. So at least we can come here to a dry spot. 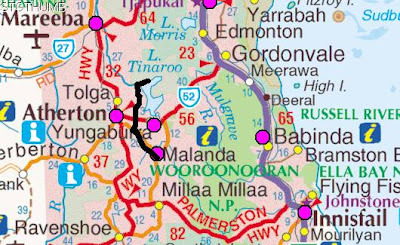 Tomorrow is another really short day to Millaa Millaa but it is another 200m higher than Malanda and so that will also be wet! not too mention there is one hell of a climb to get to it and from Millaa Millaa standing at 910m above sea level we will descend to Innisfail which is at sea level on Tuesday! ... I remember last time Neil and I were here at Malanda falls (ah the memories are flooding back now!) we had the same sort of wet weather and got stuck here and had to see the falls between showers! We woke this morning to find the weather really hasn't changed that much and listened to the local weather and it should begin to start clearing this afternoon so we will stay here today (it is a sense of "deja vu" as exactly the same thing happened last time we were here!) and hopefully move on tomorrow.